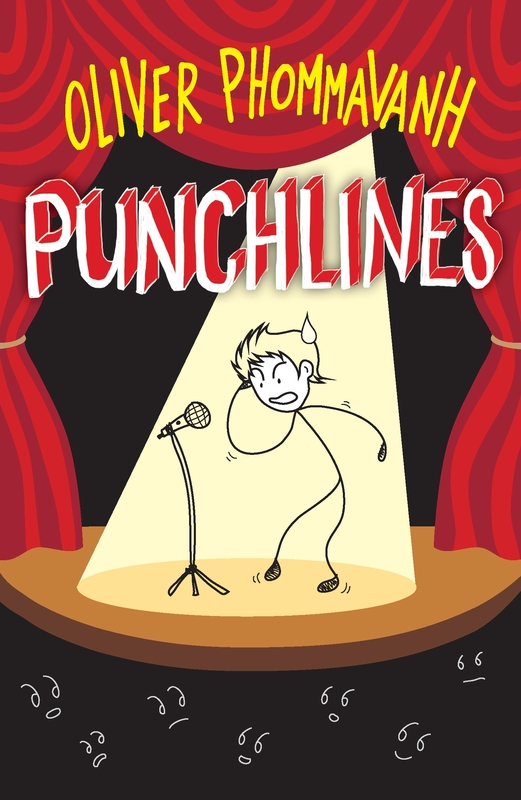 Punchlines is about a boy trying to be funny to get the girl. It’s the story of my life, give or take a few semi-fictional characters. I’ve drawn from my own journey of a class clown graduating to a comedian. Johnny and I share the same traits, we both wanted to be funny and popular. But is it possible to be both? Not if you have Johnny’s warped sense of humour. But it’s his reluctance to hog the spotlight that makes him a typical comedian. There’s a difference between a comedian and someone who tells funny jokes at parties. I find that comedians are quite fragile off stage and hide behind our jokes. I used my own flaws and insecurities for jokes. If I made fun of myself then people’s insults couldn’t hurt me. Johnny does this throughout the story though he does stray to his friends and family. Teenagers use comedy for many reasons, to mask their own fears, make light of a tense situation and to unleash their anger and frustration. It moulds their personality and the way they socialise. I see this all the time when I do my school visits. I try to tap into the audience’s sense of humour. Sometimes my jokes works, sometimes they don’t. But I come away with a whole swag of comic observations. The story is spilt into two worlds, high school and the comedy scene. I had exactly the same friends as Jeffro and Razeal, two boys who just got me. We egged each other on to muck up in public, we were embarrassment-proof. We did pranks for own enjoyment, not for YouTube glory. Through the Bad Bugs, I wanted to tap inside a teenager’s unique sense of humour, the kind that would alienate adults (and other ‘normal’ kids). I used to perform speeches that were more like stand-up routines. I still get that adrenaline rush when I go on stage. I wanted to capture this knife-edge feeling of anxiety and joy in the stand-up scenes. Yeah I killed on some nights, felt bulletproof and then died the next night. Comedy is a roller coaster. You just gotta ride it and hope you don’t puke. 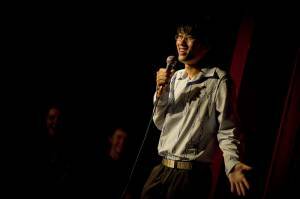 It’s cool to write a story where I can share my own comedy tips for any aspiring comedians. Harry and Shamus, the two comedy veterans are based on my own unofficial mentors. They didn’t offer to help me, it just happened. I really valued their advice when I was starting out. I cut my comedy teeth in a venue similar to the Jokey Pokey. It’s one of many paths you can take to become a comedian. The competitions might seem like a short cut but you can only get better when you get stage time. I hope that comes through with Punchlines. Comedy is the glue that sticks relationships together. Johnny’s relationship with his dad is tested throughout the book, but it’s their gentle jabbing at each other that makes them grow closer. I guess parents need a sense of humour when they deal with teens or they’ll go mad. But I’m glad that my parents found the lighter side of life when I was growing up. There’s a little romance in the book, inspired by all those articles that say a man’s sense of humour sits at or near the top of what is attractive to women. Laughter is the best medicine, its powerful stuff. If you can make a girl laugh then…well, I don’t know, when it does happen I’ll let you know. Trying to impress your partner or potential partner can be tough. Johnny is convinced that Josie is the one because they’re on the same comedy wavelength. His pursuit for Josie spurs his comedy on in many ways. Sure, he wants the fame and the glory, but he’d trade it all for a standing ovation from her. 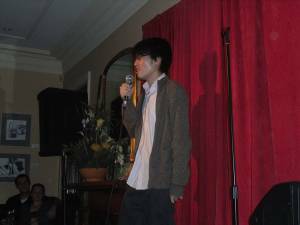 I started doing stand-up comedy because I wanted to test out my humour. You find out very quickly if something’s funny or not on stage. 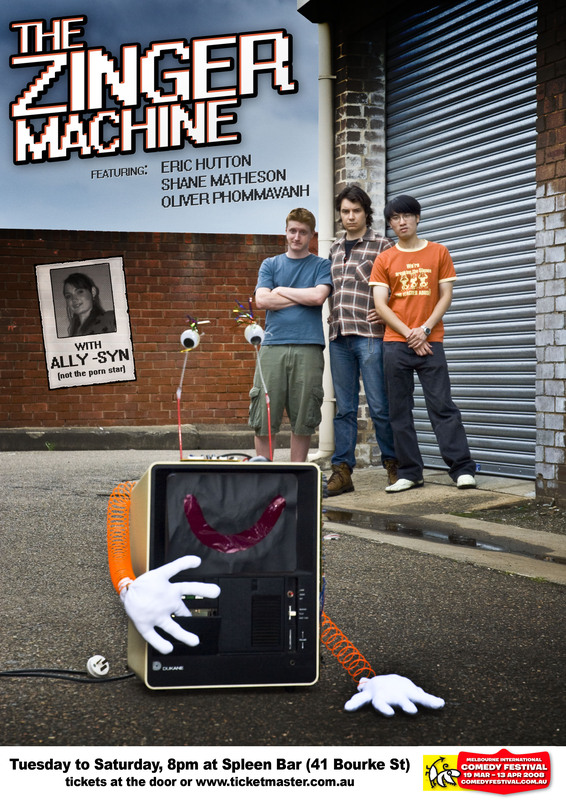 I’ll just have to assume that people will be laughing when they read Punchlines. It doesn’t matter if they laugh at Johnny or with him, I’m sure he won’t mind. As a comedian, he’d take what he can get.